Three weeks ago with Jonathan from Fluent C++, we announced a coding challenge: link here. First of all, I’d like to thank you all for the submissions to the challenge. The task was ambitious! The final solution wasn’t just a few lines of code, but more than 100… on the average around 200 LOC… sometimes even more. To write such app for sure, you had to spend a few good hours. We appreciate your time and effort! If you’re one of the participants, you should be proud of yourself! You’ve learnt some C++17 and wrote a working app! The task proposed in the challenge is to write a command line tool that takes in a CSV file, overwrites all the data of a given column by a given value, and outputs the results into a new CSV file. In other words, you had to code a command line tool that transforms an input CSV file with some rules and then saves it as a new file. 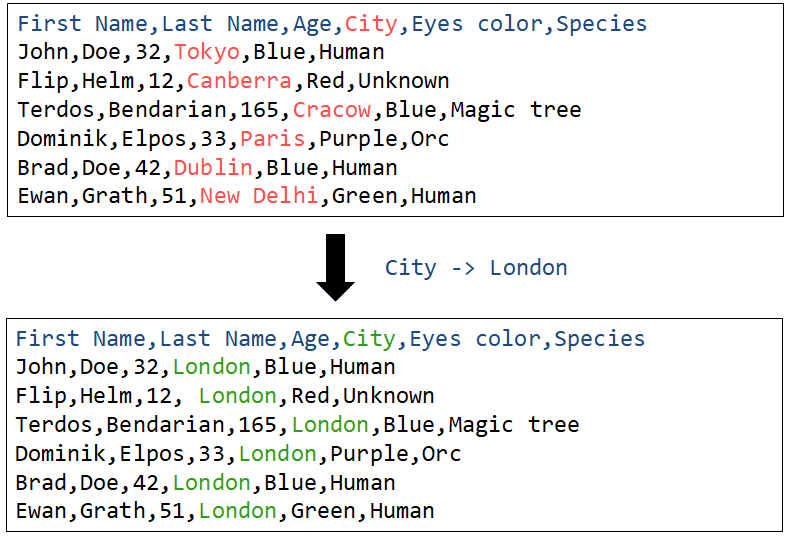 Replace fields under the “City” label, with “London”. We want all the people from the input file to be now located in London. I work as an Intensive Care and Emergency Physician (a.k.a intensivist) in my cities ICU’s. I’m a Linux enthusiast since the 90’s, which in an almost natural way led me to be interested in programming. I have a strong background on shell script and Python, which I have also used for data analysis. But a few years ago I was working with Raspberry-Pi projects, and I felt the lack of performance of my approach using Python and Bash scripts, and I decided to give C++ another try. Man, what a different language!! All the algorithms I liked were there on the STL… And the containers, the performance, RAII, everything feels so natural that I never turned back. Wow! So there’s hope in C++, with the modern features and coding style :) I wish more and more people will perceive C++ that way. The code reads the input data from argv. If the column index was found we get into the transform code that does all of the replacement. There’s a structured binding used to store streams of the input and output. [[nodiscard]] will remind you actually to use the return value somewhere. See my post about C++17 attribs. The code is super clean and so easy to read. I don’t have to add any comments, very easy to read and clean. … I think that a simple problem screamingly demands a simple solution, since correct of course. The code is a perfect example of modern C++. And this is why Jonathan and me chose him as the winner. In this solution the author usedline_iterator and tag_iterator. With those core tools, he was able to traverse the file efficiently. Also, such approach looks very scalable and can be easily adapted for other requirements. This is an advanced code, so we were really impressed with the quality and effort to write such beauty. In my C++17 articles, I forgot to mention, that std::iterator is now deprecated. I am glad that all of the solutions where an iterator was proposed remembered about this spec change. SO: Why is std::iterator deprecated? Surprisingly, a lot of people used std::experimental::ostream_joiner from Library Fundamentals V2. This is not yet in the standard, as I know, but looks really good. Basically it’s an ‘optimized’ version of ostream_iterator. It usually makes only one write to the output for a range of values. Once again thank you for the code, it was a great experience to review them. I see how much I need to learn to write such code! If C++ has the reputation for being too much “expert friendly”, it do not need to be that way, specially if you keep simple things simple.